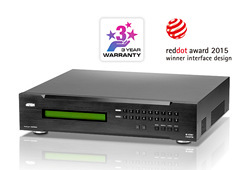 Video Matrix Switches | Simply Connect Pte Ltd.
4K is the next generation of image quality for high definition video. 4K delivers eight million pixels which is four times as much detail as 1080p Full HD resolutions. 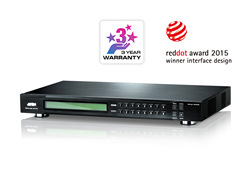 ATEN’s VM6404H 4K HDMI Matrix Switch with Scaler is compatible with the two latest 4K video resolution standards: 3840 x 2160 and 4096 x 2160. The VM5808H 8 x 8 HDMI Matrix Switch is a distinct HDMI solution that offers an easy and affordable way to route any of 8 HDMI video sources to any of 8 HDMI displays. The ATEN VM0404HA 4x4 4K HDMI Matrix Switch supports 4K resolutions of UHD (3840 x 2160) and DCI (4096 x 2160) with refresh rates of 30 Hz (4:4:4) and 60 Hz (4:2:0). The ATEN VM0808HA 8x8 4K HDMI Matrix Switch supports 4K resolutions of UHD (3840 x 2160) and DCI (4096 x 2160) with refresh rates of 30 Hz (4:4:4) and 60 Hz (4:2:0). The VanCryst™ Media Matrix Solution is a combination of the VM1616T 16x16 Cat 5 A/V Matrix Switch and the VE500/VE300 A/V Over Cat 5 Extender. The VM1616T is a Matrix Switch that routes and distributes audio, video, and RS-232 signals over distances of up to 300 m with 1920 x 1200 video resolution. 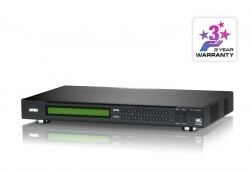 The ATEN VanCryst VM0808 8x8 Video Matrix Switch allows you to connect eight VGA source devices to eight VGA monitors, displays, or projectors at the same time. The VanCryst™ Media Matrix Solution is a combination of the VM0808T 8x8 Cat 5 A/V Matrix Switch and the VE500 / VE300 A/V Over Cat 5 Extender. The VM0808T is a Matrix Switch that routes and distributes audio, video, and RS-232 signals over distances of up to 300 m with 1280x1024 video resolution. 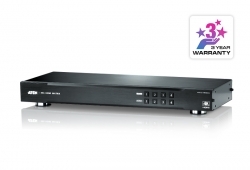 The VM0404H is a 4x4 HDMI Matrix Switch that provides a convenient way to route high definition video and audio from any of four HDMI sources to any of four HDMI displays. The VM0404H allows you to connect four HDMI devices.